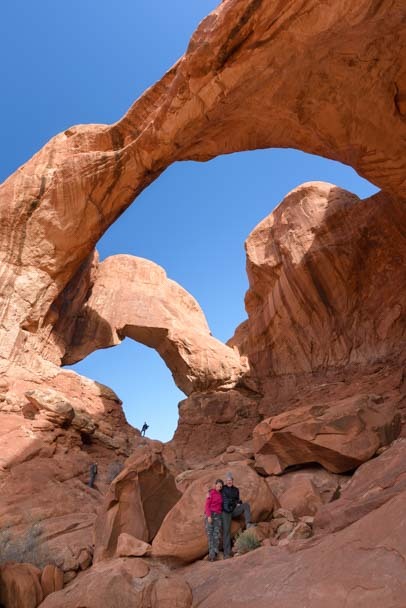 Arches National Park Utah - A Playground of Red Rock Bridges! 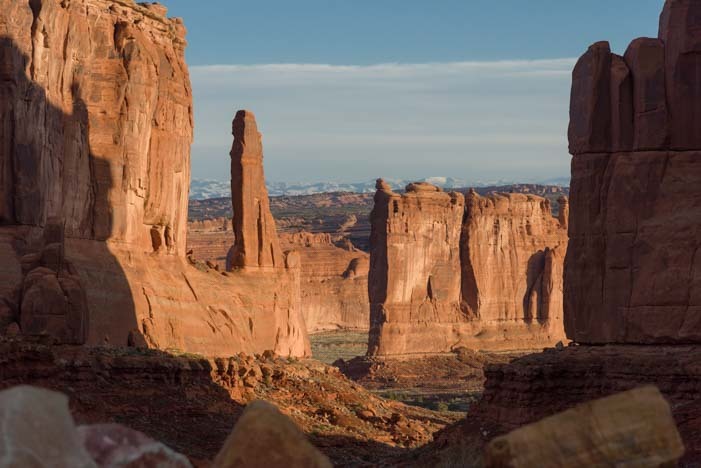 Arches National Park Utah – A Playground of Soaring Red Rock Bridges! 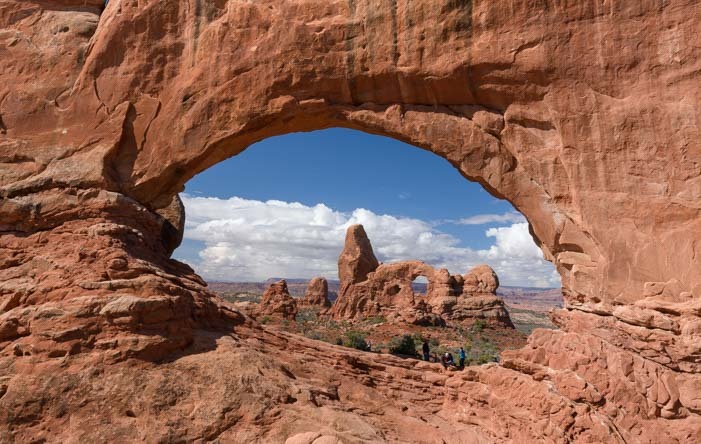 April 2016 – Arches National Park lies just outside of Moab, Utah, and it has the highest density of natural stone arches in the world. Like all the National Parks, it deserves a week’s stay, at the least, but on this particular RV roadtrip we spun through in just a day. There are dozens of arches, each with its own name and personality. 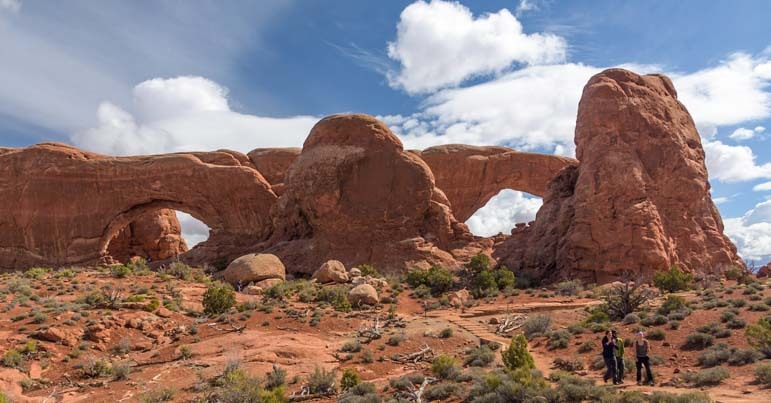 Our first stop was at Double Arch, so named because it is exactly that: two arches that are joined together at one end. 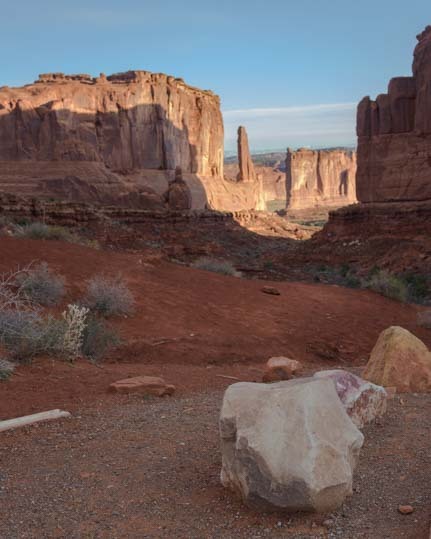 The thing that is impossible to grasp from photos of these magnificent sandstone sculptures that Nature has crafted by way of water, ice and wind, is the immense size. We crawled all around the interior of this beautiful pair of arches for quite some time and then got a selfie at their doorstep. 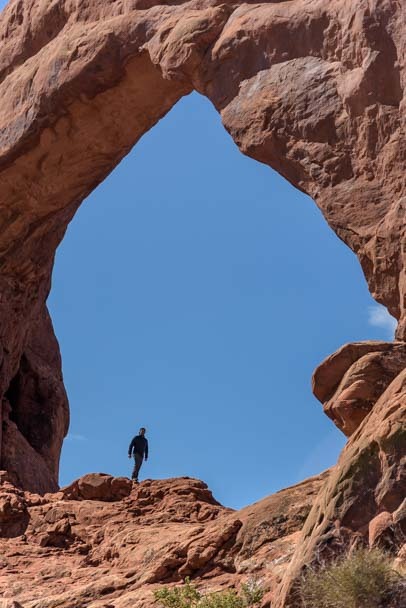 All of the arches at Arches National Park are gargantuan, and people exploring them disappear into mere specks. 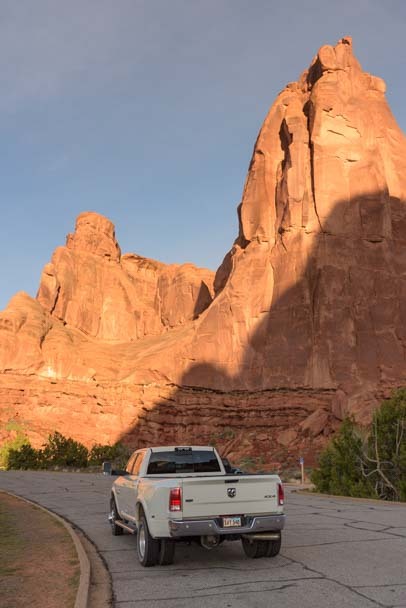 One of the most fun things at Arches National Park is crawling all around these beautiful arches. 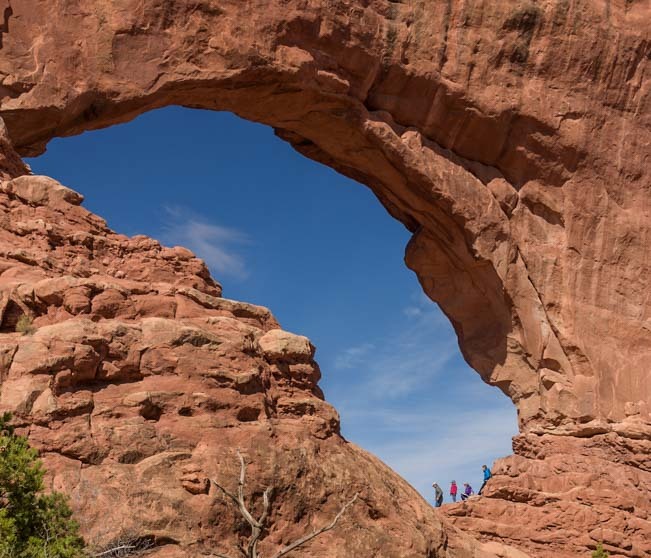 Every arch has a different shape, and they all change shape as you hike towards them and through them. There are arches of every imaginable size and shape. Some have a long staircase leading up to them, courtesy of the National Park Service. Stairs lead up to a beautiful arch. And some offer a wonderful framed view when you stand beneath the peak of the arch and look out. Sometimes, the view through the arch is sensational! Arches aren’t all there is to see at Arches National Park, though. There are towers and cliffs of all kinds. Arches National Park has wonderful pinnacles and red rock walls too. The red rock sandstone is very sheer in places, forming immense walls and giant corridors. Park Avenue — Nature’s version! 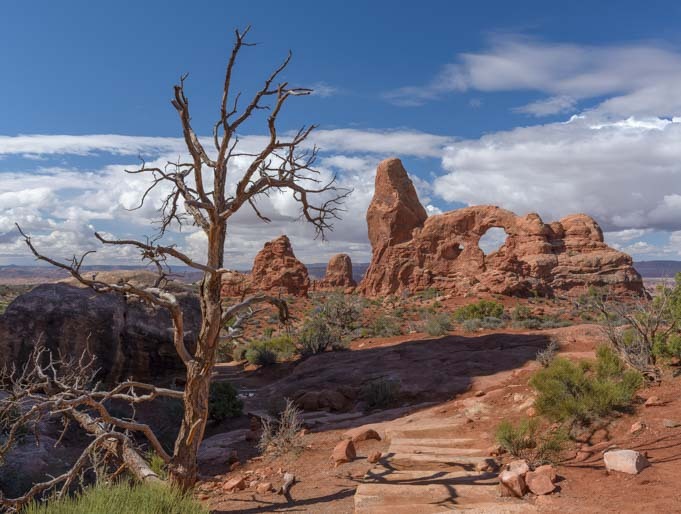 Arches National Park is an ideal family destination, with room aplenty for the kids to run around. The tourists were thick — it was Spring Break while we were there — and people were having a blast climbing all over the rocks everywhere. 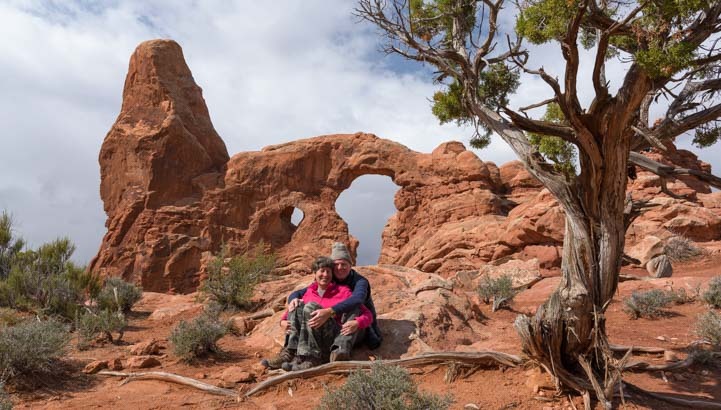 Arches National Park is a fabulous place for families with a little something for everyone. Moms and dads were very busy with young kids who’d discovered that Arches is one enormous playground. 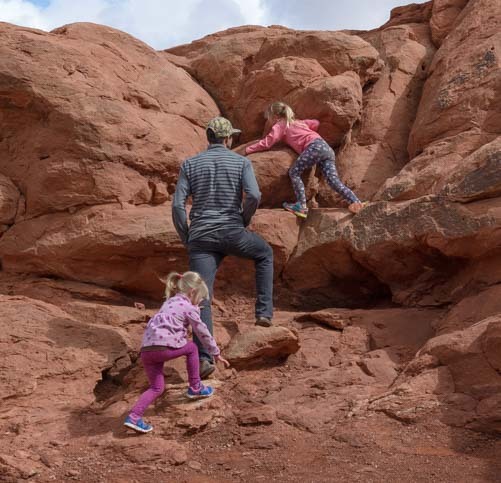 Two adorable girls kept dad busy in the mammoth “playground” that is Arches National Park. The scenery is astonishing, and it is impossible to take more than a few steps without getting yet another photo. We were blown away by the landscapes. So many folks were taking photos, lots of pics became photos of photographers taking photos! 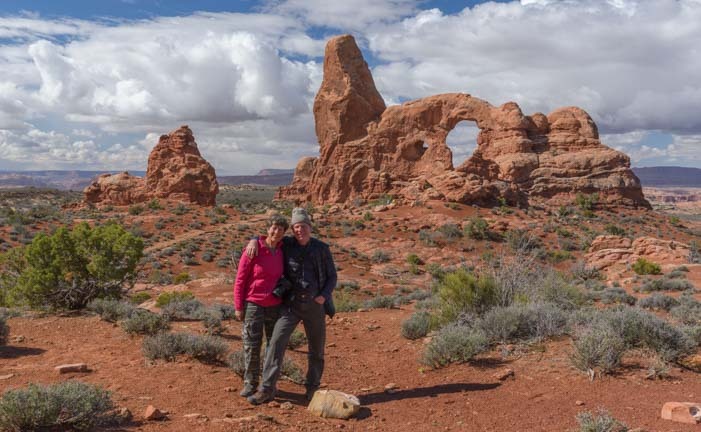 Like the Needles at Canyonlands and Valley of the Gods and Horseshoe Bend, we couldn’t help but join the crowd of selfie takers to get a shot of ourselves in this extraordinary setting. What a great day and place! Aww, we had to take more than one. Turret Arch makes a wonderful backdrop! The clouds rolled across the sky in thick battalions, and there was an intense threat of rain on the horizon. As we watched one particularly menacing black cloud gathering steam in the distance, we decided to hustle back to the truck to avoid getting drenched. We had had hopes of catching the arches at sunrise and sunset, playing with twinkling starbursts and the Milky Way. But the weather didn’t cooperate, so we’ll have to return. 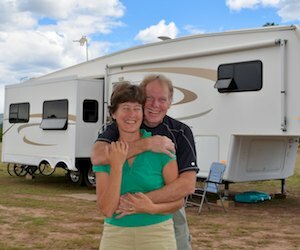 Once again, rather than checking a destination off of our bucket list, all we did was whet our appetites to come back with our RV for more! Arches National Park is awesome for an RV roadtrip. 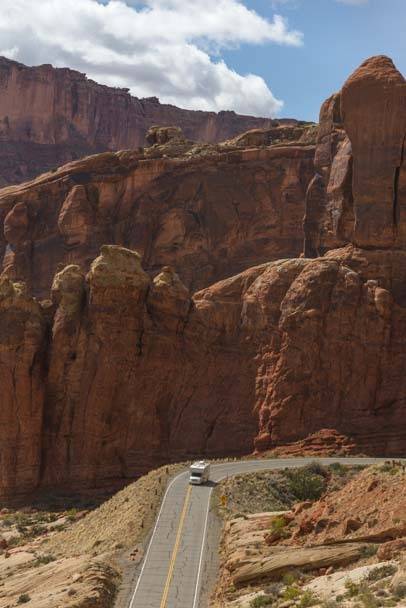 If your RV travels take you to the Moab area, Arches National Park is stunning and a definite “do not miss” destination. 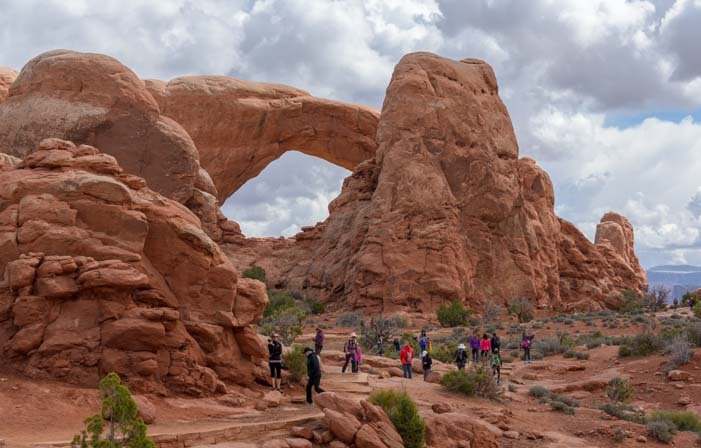 A word of caution: Arches National Park is extremely overrun with tourists. By noon everyday, the line of cars waiting at the entrance numbered at least 15 or more while we were in Moab. But it is for very good reason: Arches is fabulous! If you can sneak into the park before sunrise (camping inside the park helps!) or shortly thereafter, you’ll have the first arch or two to yourself. After that, it’s a big old party. But what a great party it is!! 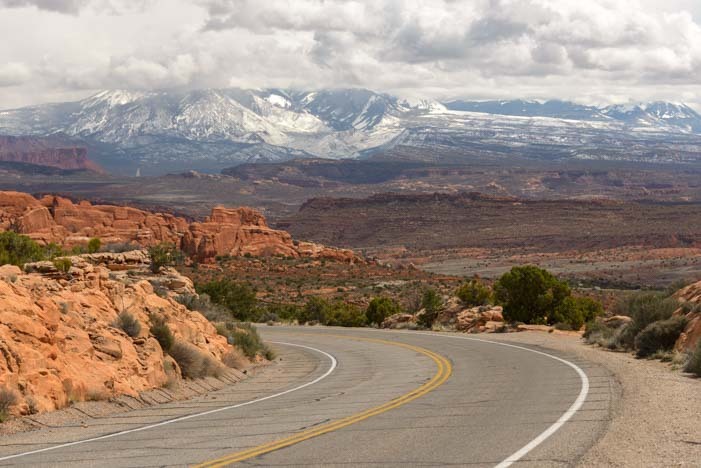 The roads near Arches National Park offer magnificent views. 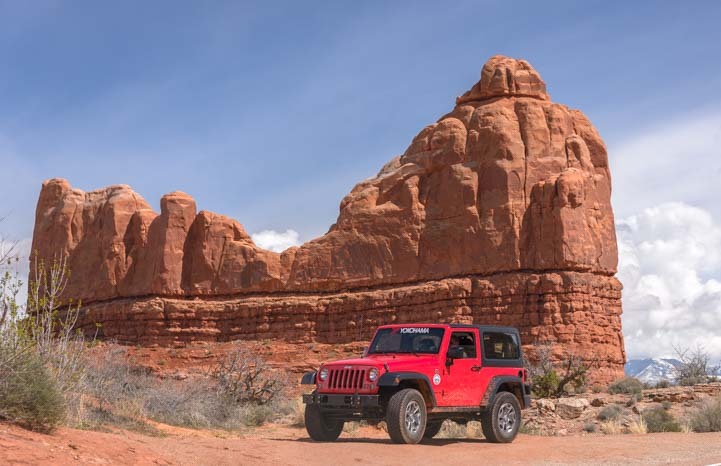 And if you go during Jeep Safari Week in Moab, the scenery in every direction will be decorated with colorful Jeeps!! 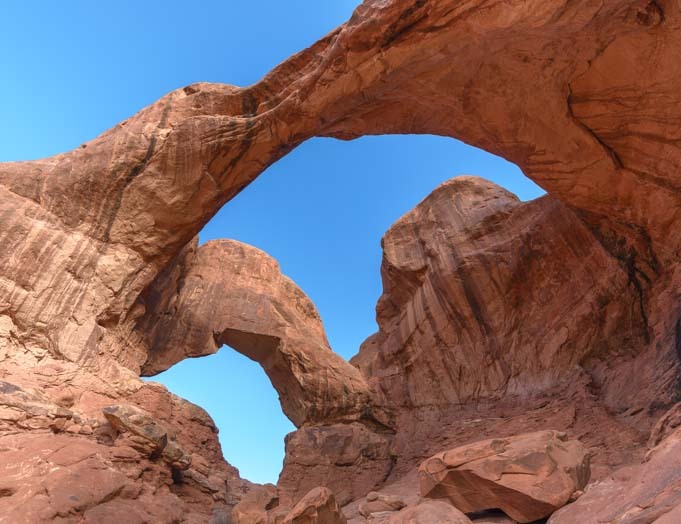 Love red rock bridges and arches? 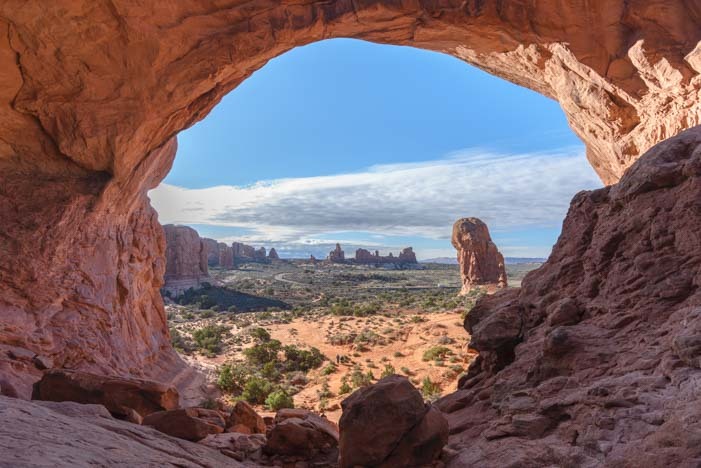 There are three true beauties at Natural Bridges National Monument in Utah, and more info and links for Arches National Park below. 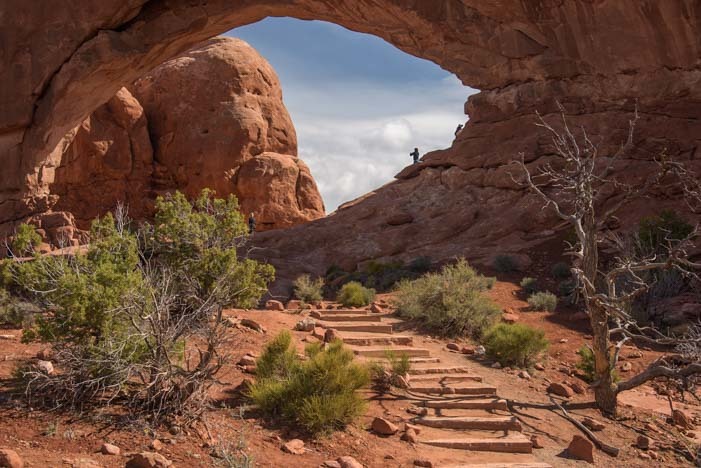 Amazing that you experienced so much of Arches in only one day! 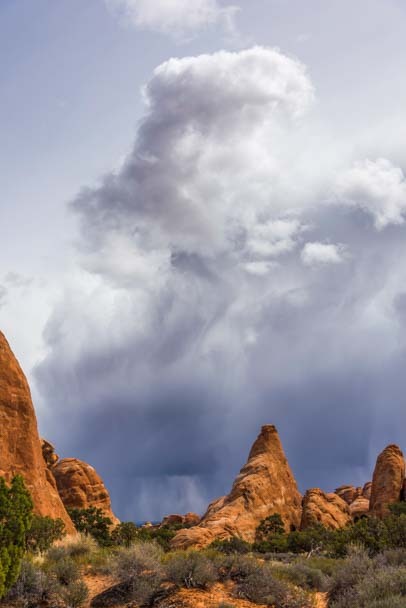 Wonderful photos of the arches — the clouds really added drama to the scenery! Very funny – It was a full day and we poured ourselves into bed that night!! !